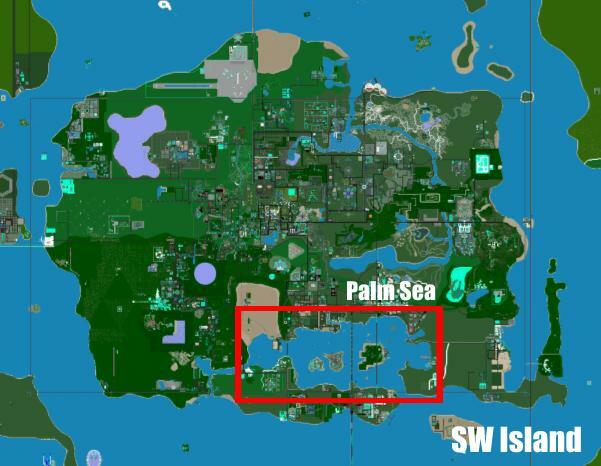 The Palm Sea is a large, tropical body of water which takes up most of the southern part of SW Island and is the centerpiece of Palm District. It is home to Flangton Island, Server Island, File Island as well as many other small, privately-owned islands. The Palm Sea Ferry service operates here, linking the various islands with points around the mainland of SW Island. The Palm Sea's west boundary is the Faldon Desert and Silver Valley?. To the south is Hyokia Island. Meta Bay makes up the eastern area of the sea, with the water link to the Irenic Ocean at the southeast corner. The Palm Sea takes a gigantic chunk out of the southern part of SW Island. It has two bays, Meta Bay to the east and Faldon Bay? to the west, which continues into Silver Valley?. Meta Bay is used as mostly a naval port while Faldon Bay has mostly residential buildings. 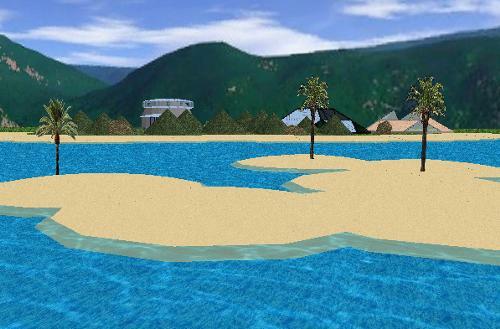 The shores of Palm Sea are completely developed with all sorts of buildings due to the high population in this area. A large portion of the shoreline is high income housing (or construction of) or docks. Businesses have taken over the Hyokia Island portion of shoreline. It is also an ideal place for construction because it is mostly surrounded by flat lands and small hills. The shorelines are prime spots for popular beaches in the hot summer months as well. Forest used to surround most of the shore, but only a small portion remains due to development and the logging industry. The sea is connected to the Irenic Ocean in two places: a small river south of Silver Valley and a much wider opening on the east shore of Hyokia Island. Large crafts such as naval ships and sometimes oil tankers exclusively use the Hyokia Island connection while smaller personal craft use the western connection to access Faldon Bay. The Palm Sea is most famous for its tropical island destinations, which have remained the most popular vacation islands for the last 50 years. Each Island can be accessed by ferry or plane (if flights are available). File Island also has a subway station connected into the Estate Loop. Geographically speaking, Flangton Island is the largest while Server Island takes second and File Island takes third. All of the islands have been almost completely developed to handle the high amount of tourists that travel to them all year round. Smaller islands are also dotted throughout the sea but are mostly private islands for wealthy citizens. Almost all of these smaller islands can only be accessed by personal transportation.